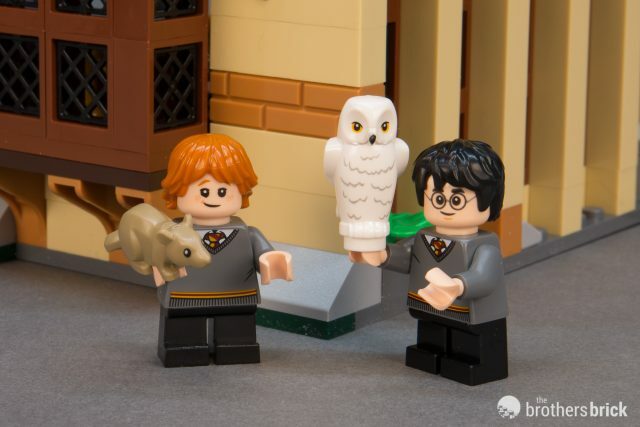 Absent as a theme for seven years, LEGO has returned to the magical land of Harry Potter. This time around the theme is titled Wizarding World, since it encompasses both the Harry Potter books/films and the current Fantastic Beasts films. 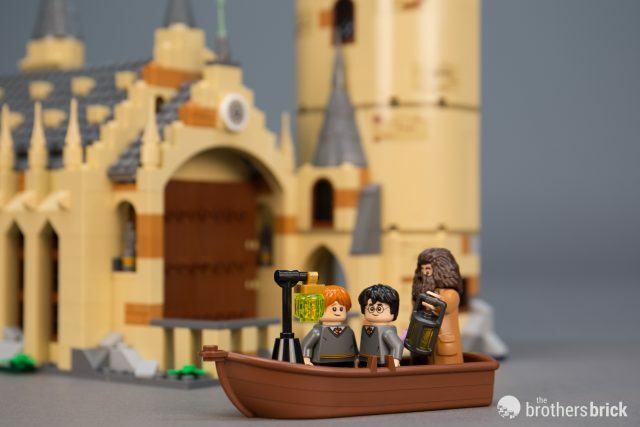 Fittingly, the largest set of the new wave is the setting for so many of Harry’s adventures, Hogwarts. 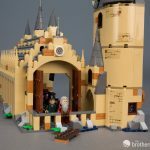 Since LEGO began producing Harry Potter sets way back in 2001, there have been at least four distinct versions of the iconic wizarding school Hogwarts, plus others set in and around the castle grounds. 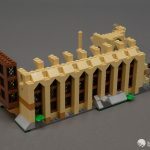 Each version has a slightly different twist, and this latest edition attempts to bring a hint of proper scale to the monolithic school, opting to forego recreating the whole castle and focusing on a single aspect in greater detail. 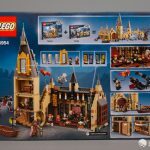 75954 Hogwarts Great Hall retails for $99.99 USD, includes 878 pieces, and is available now in the USA, and elsewhere Aug. 1. 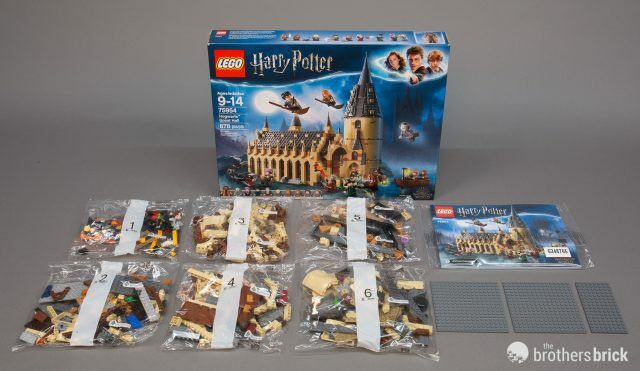 Despite having nearly 900 pieces, the box contains only six numbered bags, each stuffed quite full. The three large dark grey plates which serve as the hall’s foundations and roof are loose in the box. The single instruction manual and the set’s two sticker sheets are sealed together in a bag. 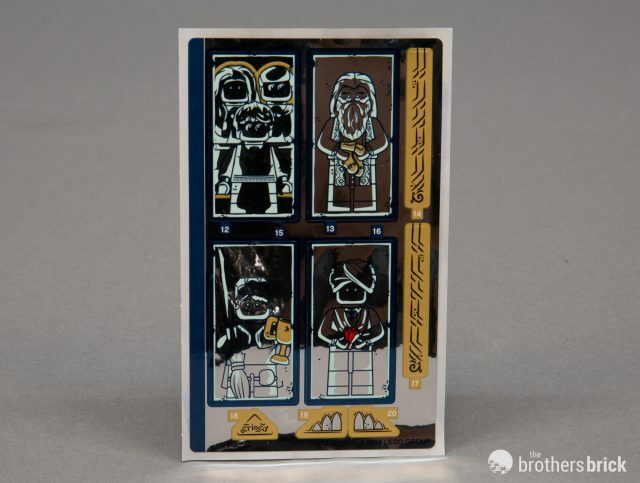 Since one of the sticker sheets is entirely devoted to the Mirror of Erised and features a reflective finish, it’s good that it’s protected, since it would be easily damaged if it were loose in the box. 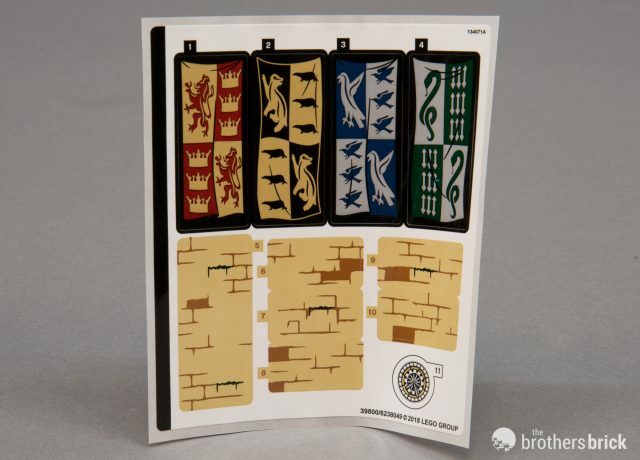 The second sticker sheet has the four house banners, the clockface, and patches of stonework for the tower. Despite the presence of the two sticker sheets, the stickering in this set feels minimal. 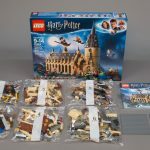 Bag 1 contains several minifigures and a series of quick mini-builds–the basilisk, boat, Fawkes the Phoenix, and Mirror of Erised–to introduce some play value to the set immediately. Bag 2 begins the Great Hall, which sits atop two dark grey 16×16 plates, with extra plates on a couple of the sides to give it slightly larger dimensions. A little rock work around the edges hints at the castle’s clifftop location. 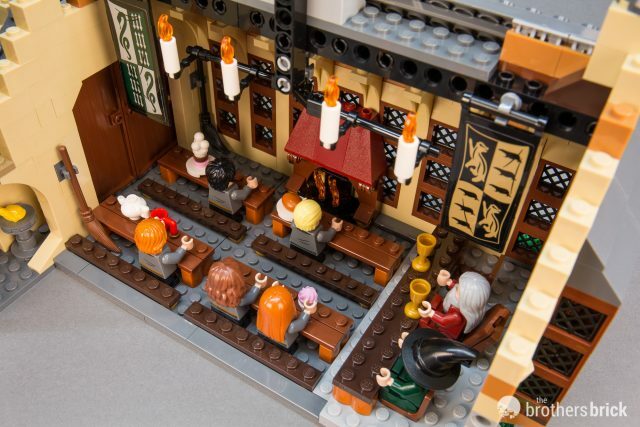 The dais for the Hogwarts staff at the front of the hall sits two plates above the rest of the floor, and is accomplished with a single large plate with studs around the edges and a blue tile beneath the center. 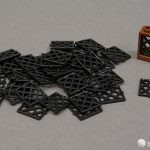 Although an odd technique at first glance, this design helps make disassembly easier, since prying apart large swaths of plates is not only frustrating but also likely to damage the elements. By the end of Bag 2, the hall has begun to take shape, the interior of the hall nearly complete with tables and food. 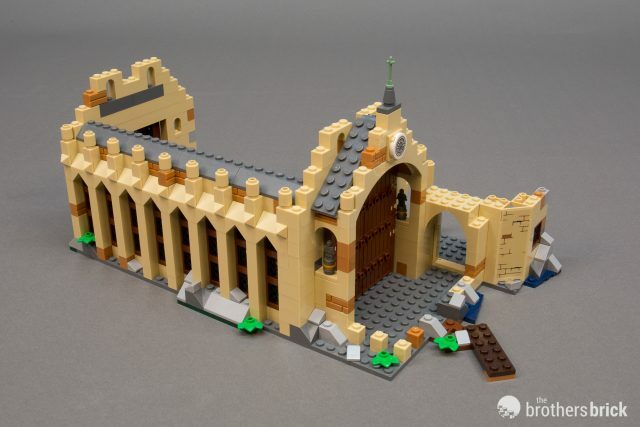 Bag 3 is a bit tedious, adding the long rows of windows and the exterior buttresses. 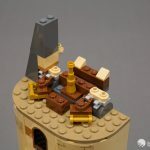 This section almost entirely consists of simple brick stacking, along with inserting panes into 40 square windows. The result, however, looks great even without the rest of the detailing in place yet. 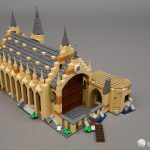 Bags 4 and 5 round out the Great Hall with a roof and gothic spikes along the eaves and a few small turreted spires along the roof’s apex. 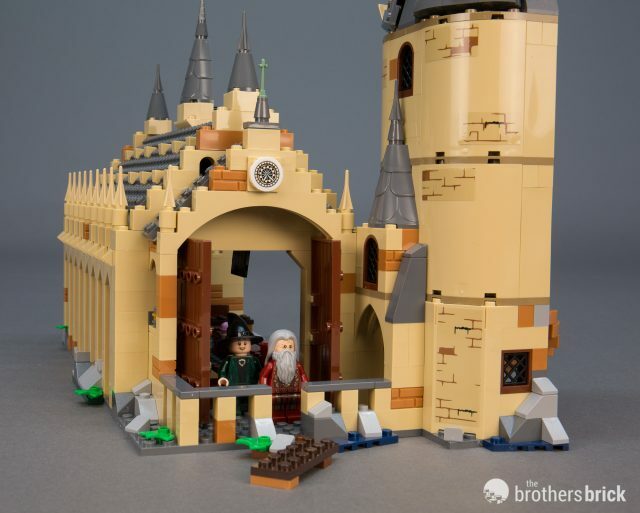 Bag 6 then adds the last remaining bit of architecture: Dumbledore’s tower. 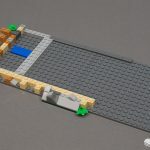 The tower has four floors, with each of the lower levels made with 4×4 quarter circle panel bricks, spaced out a few studs for a larger footprint. The roof uses a combination of conical elements and some angled plates to create the large spire roof, and the plates are held in place at 45° in relation to the stud rows thanks to a neat technique that eschews turntables or hinges, relying instead on the natural tolerances afforded by half-stud offsets. 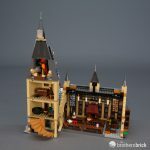 Hogwarts is a magical place, especially for builders who like new elements. 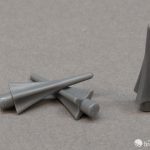 There are quite a few entirely new elements in the Hogwarts Great Hall, some of which are currently unique to the set, and others appear in a number of sets in this wave, like the magical wands. 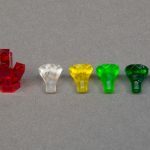 Speaking of the wands, this set is a great way to get your hands on a lot of them at once, as the set includes eight total across four different colors. 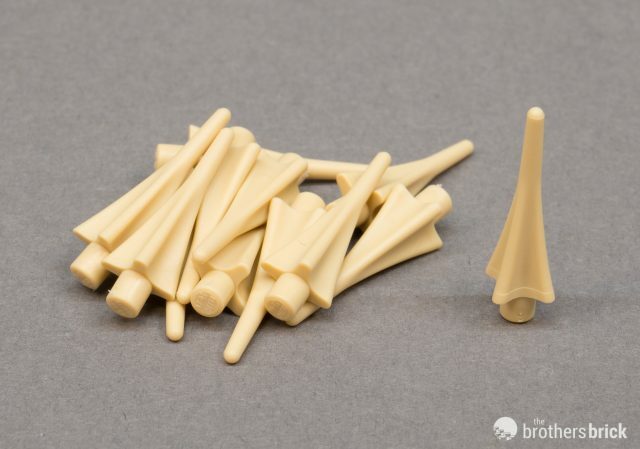 The wands are packaged as pairs attached to a sprue, which is great news for smaller sets that may feature only a single wizarding character. In this set, all eight wands belong to a wizard or witch, with no extras. 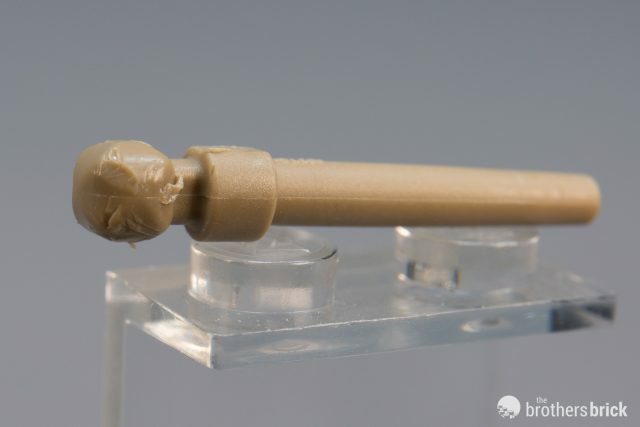 Removing the wands from the sprue cleanly proved a little challenging, with the sprue attachment point at the base where the minifigure holds it, not wanting to let go cleanly. The wands featured in all the previous sets were simply black or brown lightsaber blades (bar 4L), making them ludicrously oversized, more akin to a walking staff than a wand useful for practicing your flick and swish technique. 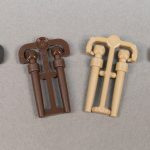 The new wands are precisely six plates in length, but apart from their looks, the cool thing about this new element is that it’s the first element with a minifigure-hand-sized ball, designed to be held by a minifigure hand in multiple directions. 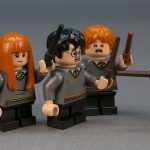 At last, minifigure wizards can assault the dark lord with proper wand technique. 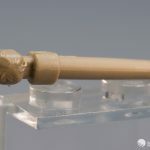 Besides the ball end, the ring around the wand can also be gripped. 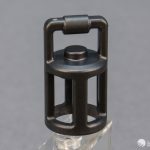 The narrow tip looks close to the size of a plume/accessory hole, but is slightly too large, placing its dimensions out of System. 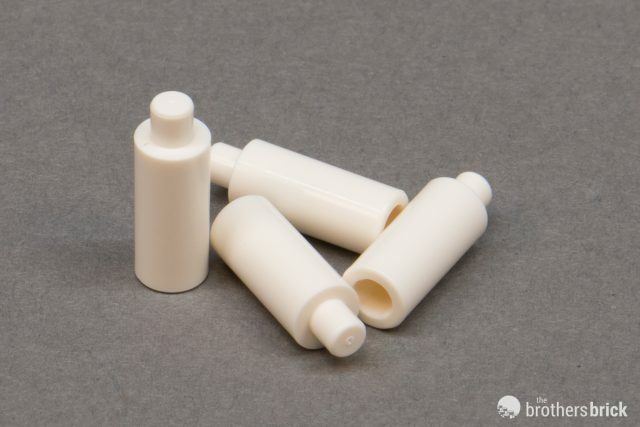 The wands are made of the same soft plastic as plants, not standard ABS. 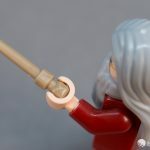 One issue that I encountered is that–because the ball is just a touch larger than a minifigure’s hand–there’s no good angle to insert the wand into a character’s hand. 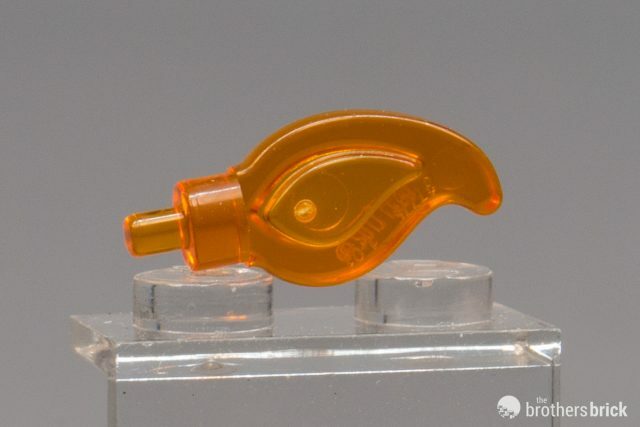 The soft plastic readily picks up nicks and scratches from normal use, similar to bows and a few other accessories. This is unlikely to bother kids, but adult fans may find their perfectionist tendencies grating. 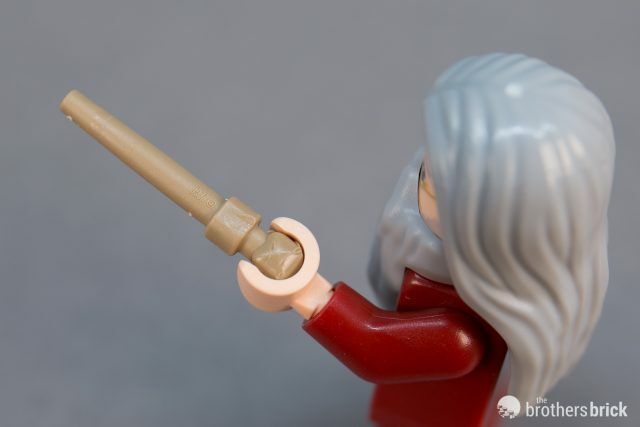 The picture below shows the state of Dumbledore’s wand after being used only for this review. Wands are far from the only new element, however. 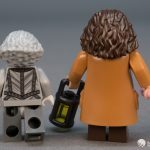 Hagrid’s lantern technically first appeared in the Xtra kit 40312 Streetlamps a few weeks ago, but it’s clearly been made for this line. 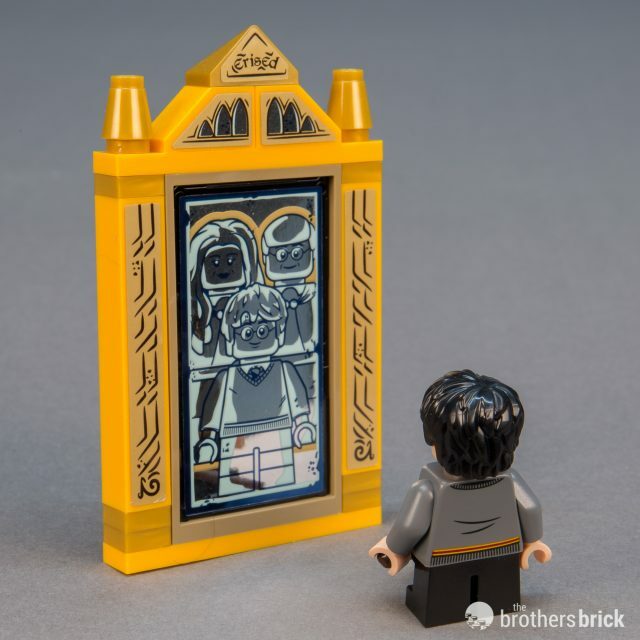 It captures a transparent yellow 1×1 round brick inside it. 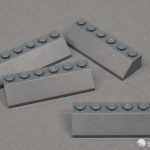 As a bit of trivia, it joins a very short list of LEGO elements that feature solid studs without the word LEGO embossed on top. 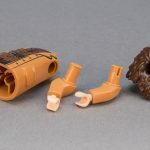 Other notable entries include the Homemaker Figure Head and a Technic connector. Let us know in the comments if you know of others. The candles which adorn the ceiling of the Great Hall consist of two new elements: a flame, and a rod connector. 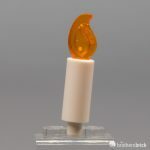 Together, they accomplish something that LEGO fans have been trying at for ages: an appropriately scaled candle that doesn’t look like a raging inferno. Just like the larger plume/flame element introduced in 2009, this one features both plume and rod sized connectors for added versatility. 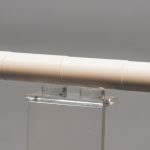 The candle, which looks remarkably like a “miss” marker for Battleship, is a simple tube slightly larger around than a stud and four plates long, with male and female rod connectors on each end. 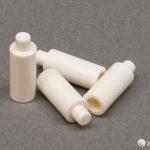 The possibilities for this element are endless, especially once they inevitably become available in more colors. 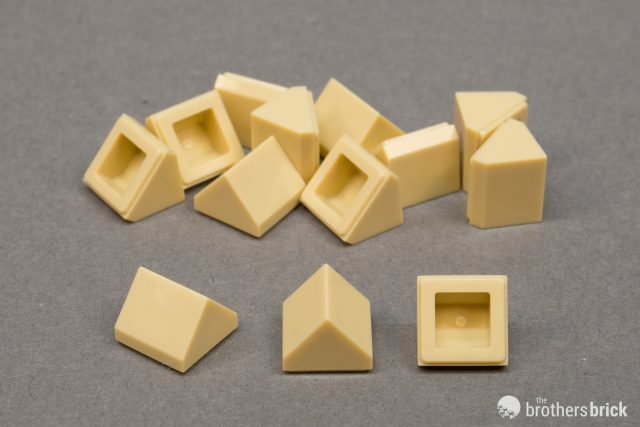 In 2004 LEGO introduced the 1x1x2/3 slope, better known as the “cheese” slope thanks to the yellow version’s resemblance to a wedge of the stuff. 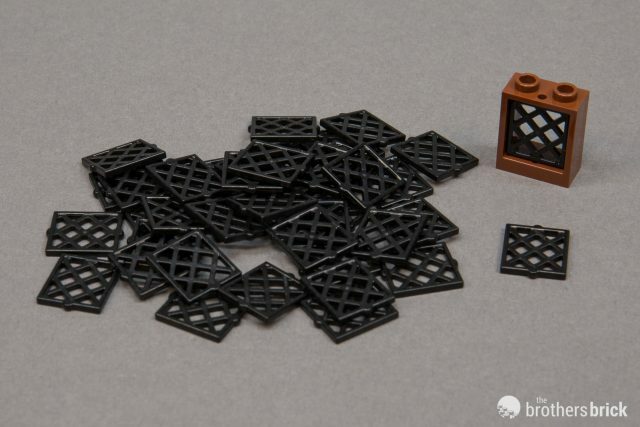 Two years ago, Nexo Knights brought us the quadruple convex 1×1 slope, or pyramid slope. 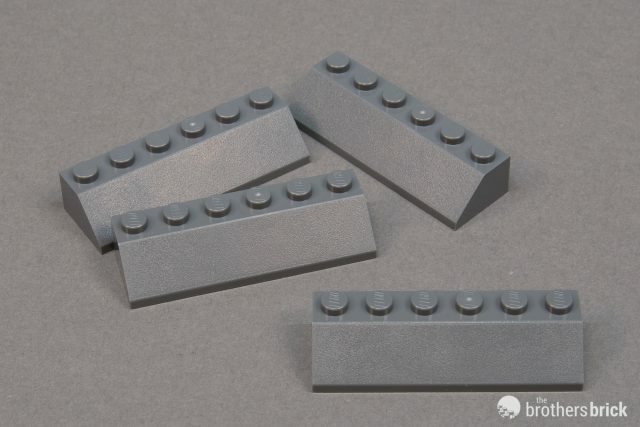 This year, LEGO is expanding the 1×1 slope category with the 1×1 double convex slope. The two sloped sides meet at the apex at an angle just a hair shallower than 90°, dashing hopes of easy integration into mosaics. Here they serve as tiny dormer windows on the Great Hall’s sloped roof. 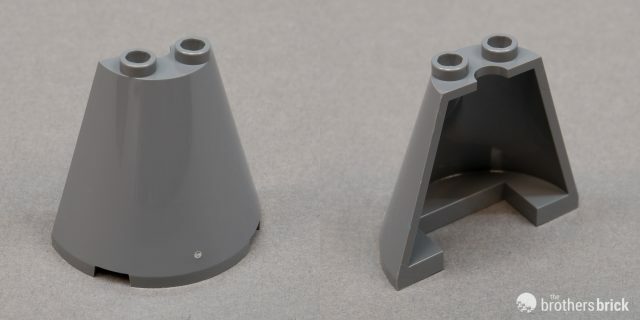 Next up we have a new type of half cone, the Cone 2x4x3. 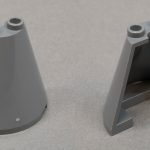 This element falls firmly in the category of “wait, why wasn’t this a piece before?” While we’ve had at least 4 styles of cones that fit on a 4×4 cylinder footprint before, only the roof tile texture half-cone 2x4x4 introduced earlier this year matches the 4x8x6 half cone in slope, and that piece has limited use outside of castle spires. 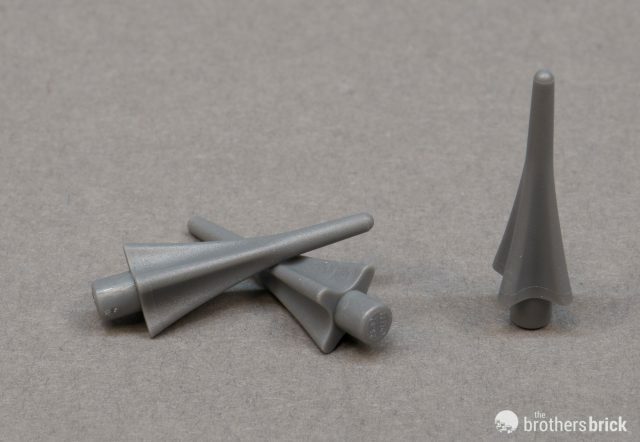 Coincidentally, that roof tile texture piece also appears in this set in dark grey for the first time. 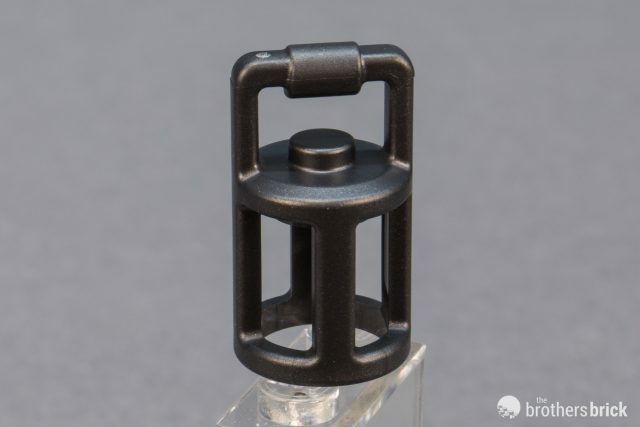 One more new element must be mentioned: the long-awaited 2×2 diamond lattice window pane insert. 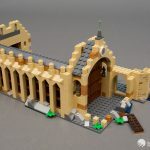 LEGO introduced the diamond lattice pane for arched windows way back in 1996, but it’s taken another 22 years for that to percolate over to the rectangular window frame. 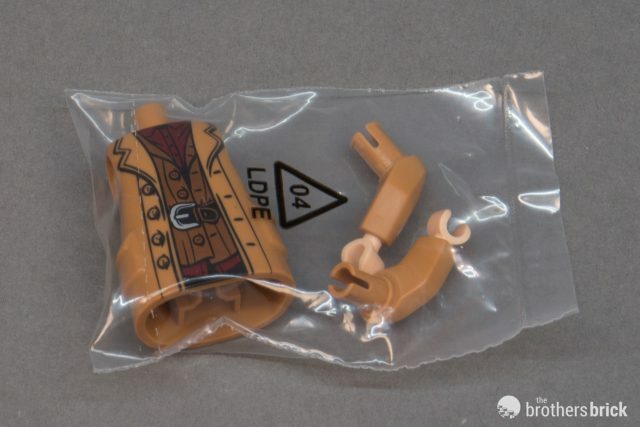 Thankfully, this set goes out of its way to make up for that dearth, providing 40 of the new pieces. Finally, there’s a multitude of elements appearing in new colors, of which this is just a sampling. And while not new, there’s a lovely rainbow of gemstones. 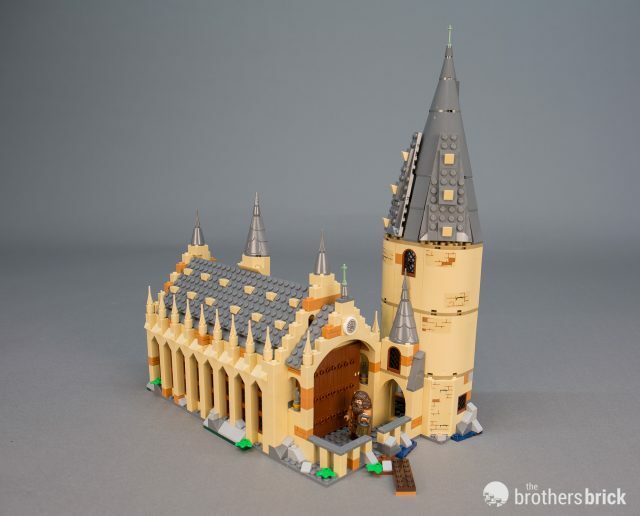 The completed structure looks stately and proud, just as Hogwarts should. 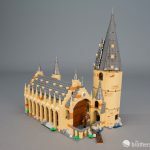 The gothic architecture carries through well, and the grey slate roofs look more accurate than the sand green used in many of the previous sets. 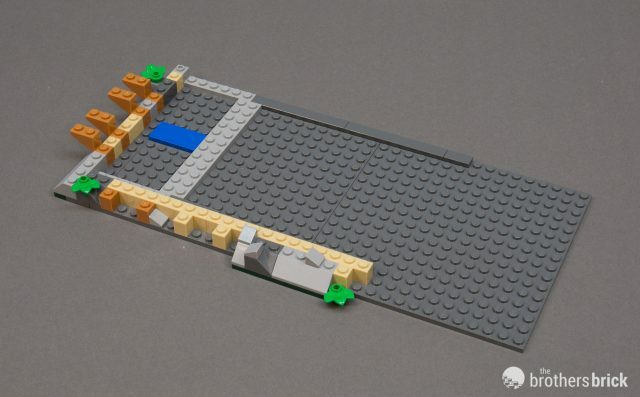 The set is a cutaway, featuring a detailed facade on one side and open access to the interior on the other. 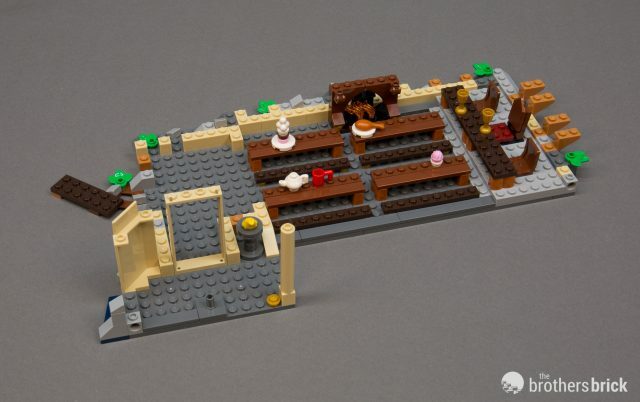 In fact, it probably helps to think of the set as two different scales, with microscale from the front and minifigure scale from the back. 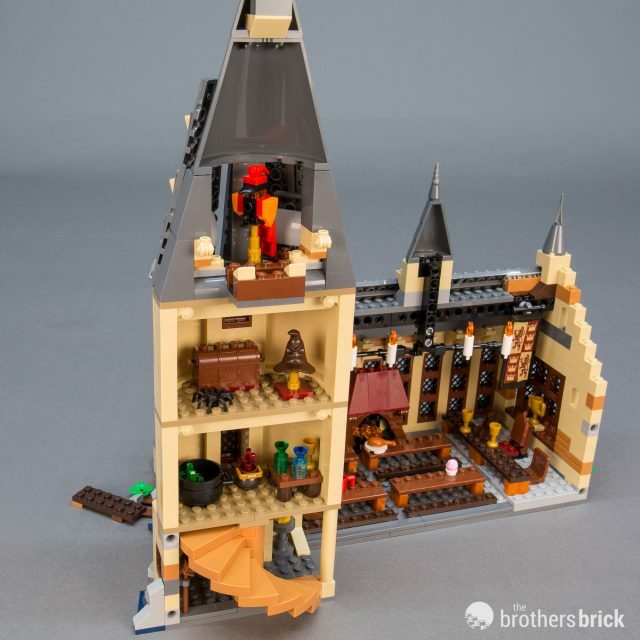 The exterior facade is moderately close to the source material, especially if you picture the porch/courtyard as microscale and not minifigure scale, and the Great Hall and Great Staircase Tower seem appropriately scaled to each other. 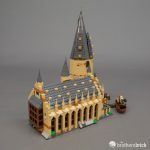 The one key missing detail is the trio of small staggered towers that make up the Headmaster’s Office, that tiny tower sprouting out of the side of the Great Staircase Tower. 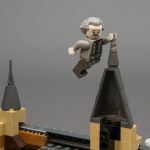 It’s an iconic part of the Hogwarts silhouette, and it’s a huge miss for it to be absent here. 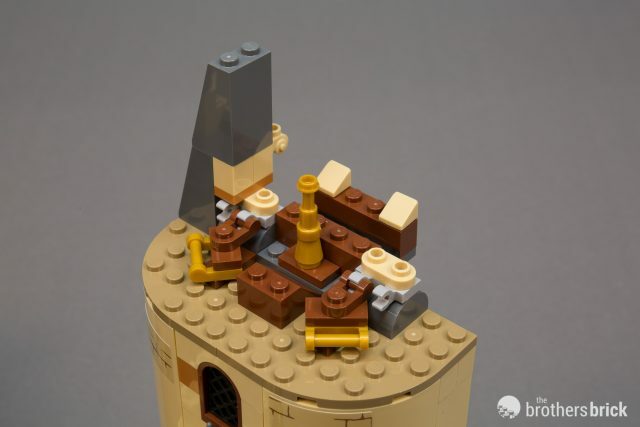 From the inside, the tower actually is a mix of scenes–more of a playset than an accurate model. 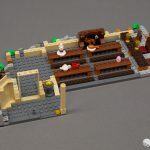 The bottom floor features a moving spiral staircase, and the first floor (we’ll say first rather than second, since Hogwarts is in the UK, after all) is a small potions class with bottles and brews. 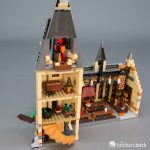 The second floor has a stand for the Sorting Hat, one of Aragog’s offspring, and a bit of treasure, and the top floor has a roost for Fawkes and a holder for the Mirror of Erised. The Mirror of Erised serves as a mini vignette on its own. You can take it down from its tower storage rack and play out its various scenes. Two mirror panels are included, each double-sided for a total of four unique portraits of deepest, darkest desires. 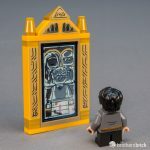 The reflective surface with sketched outlines of minifigures is charming in a uniquely LEGO way. 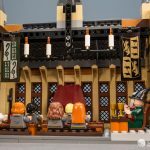 The interior of the Great Hall looks magnificent, with candles floating high above and house banners proudly displayed at each end. 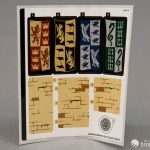 The banners are double-sided, with Ravenclaw and Slytherin on one and Hufflepuff and Gryffindor on the other. 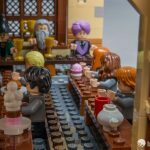 For all their simplicity, the tables and benches work remarkably well with the short-legged Hogwarts students, and the hall gives the feeling of a much larger space. 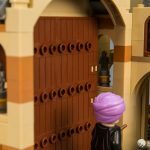 Going back outside, the front courtyard looks good, though the scaling effect is spoiled a bit by the presence of minifigures. 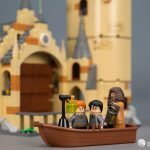 There’s a small dock for Hagrid to take new students on the unusual hazing ritual of approach by boat. 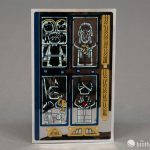 Interestingly, the set has undergone quite a few changes from the version we handled at Toy Fair New York in February. Look closely, and you’ll note that this set dropped an entire layer of bricks from the foundation, and–much to our disappointment–removed the awesome new arch elements from the courtyard fence. 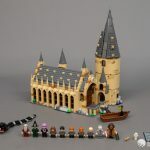 Hogwarts Great Hall includes 10 minifigures and a number of creatures. 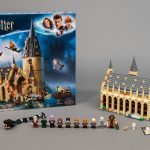 The set is centered around Harry’s first two years at the wizarding school, with creatures and characters from both Harry Potter and the Philosopher’s Stone and Harry Potter and the Chamber of Secrets. 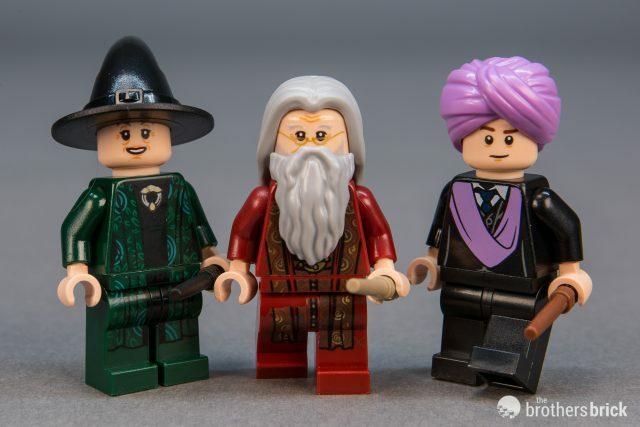 The set includes three professors: Transfiguration professor Minerva McGonagall, Headmaster Albus Dumbledore, and Defense Against the Dark Arts professor Quirinus Quirrell. 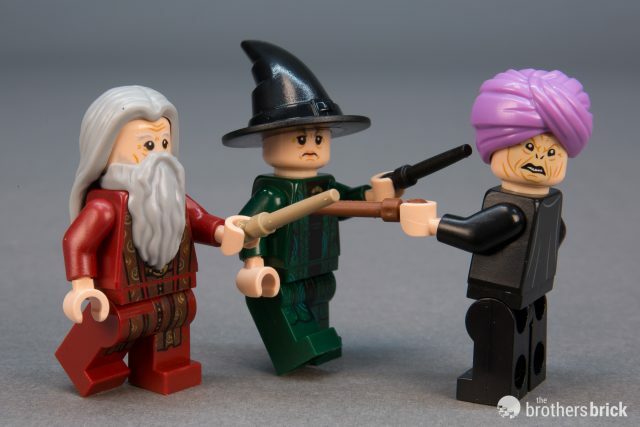 McGonagall is the weakest of the three characters, looking only a bit like her on-screen character, partly due to the use of legs rather than the new skirt piece (as she had in early versions of this set). 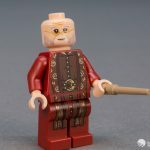 Dumbledore is Richard Harris’ film portrayal rather than Michael Gambon’s, and he sports a new long grey hairpiece. 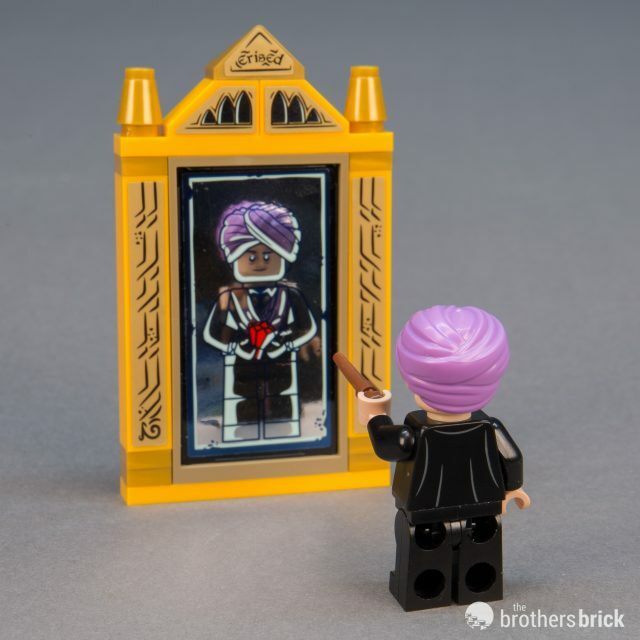 Quirrell is a character long missing from the LEGO lineup, having only appeared once before in a small set in 2001, before the line had transitioned to skin-toned minifigures. 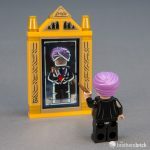 Quirrell hides a monstrous secret beneath his bright turban, and both Dumbledore and McGonagall have reversible heads to show their displeasure in finding one of their colleagues serving the dark lord. 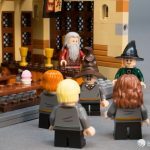 All three characters have printing on the back, and Dumbledore has detailed printing on the front that’s normally covered by his beard. 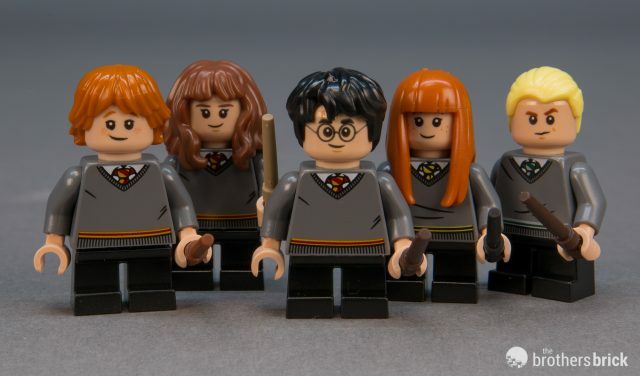 Five Hogwarts students are included: Ron Weasley, Hermione Granger, Harry Potter, Susan Bones, and Draco Malfoy. 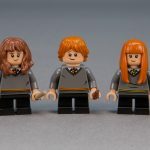 Being from Gryffindor, Ron, Hermione, and Harry all share the same torso with their house colors on their ties and sweaters. Susan and Draco each sport their own Hufflepuff and Slytherin colors with prints that are subtly different. 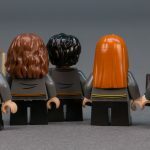 Despite 10 years worth of Harry Potter sets before now, Susan marks the first appearance of a character in a Hufflepuff school uniform (not counting that one microfig). 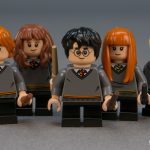 LEGO’s graphic designers have done a fantastic job of designing the characters’ faces to look childish, appropriate for these first- or second-year students. All five students have reversible heads showing anger, sadness, or fear. 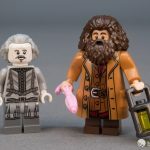 And then we have two staples of Hogwarts, the beloved Care of Magical Creatures professor Rubeus Hagrid and Sir Nicholas de Mimsy-Porpington, better known as Nearly Headless Nick. 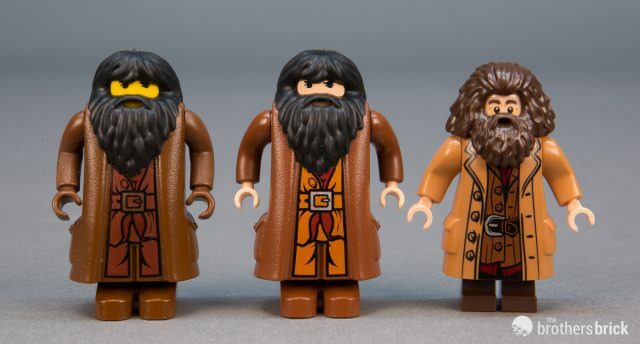 Hagrid, being a half-giant, towers above the rest of the characters, and therefore a standard minifigure won’t do. 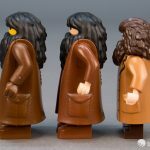 Since the very beginning, LEGO Hagrid versions have used a custom torso. The arms were redesigned in 2004–keeping the hands with creepy molded fingers–but the awkward body with ludicrously large feet persisted. 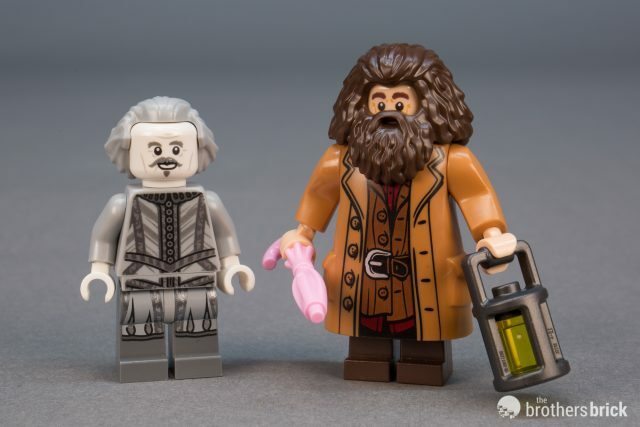 Finally, however, LEGO has given Hagrid a proper makeover from top to bottom, and it’s an astounding upgrade. 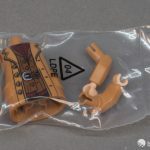 The new version uses short minifigure legs, arms with Technic pin connectors and standard minifigure hands. 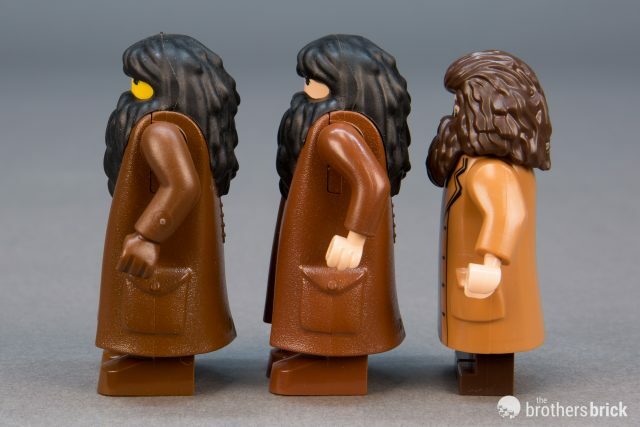 Hagrid also gets a new, more accurate beard/hairpiece, which is hard plastic unlike the older rubber version. 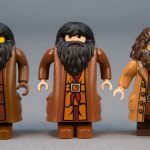 Hagrid’s head is single-sided and the torso only decorated on the front, though Nick shows a frown on the reverse and has detailed torso printing on both sides. 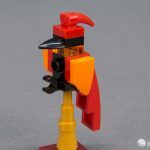 Next up we have Fawkes the Phoenix, the amazing bird of flame and fire. 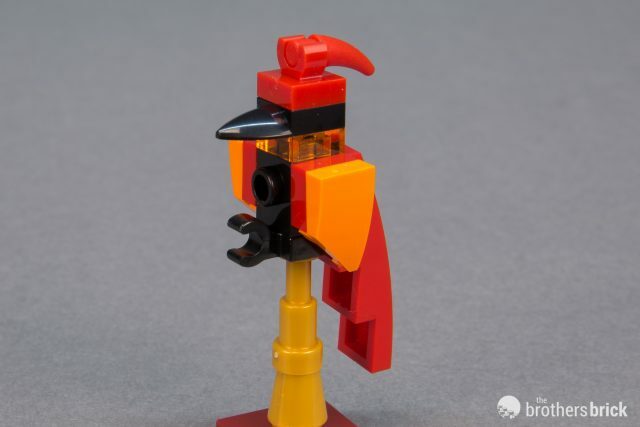 Fawkes is brick built, a simple combination of common red, orange, and black pieces. 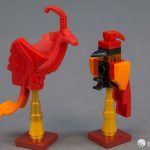 Fawkes is an admirable effort at sculpting an elegant creature at this small scale, and we’d probably think it looks quite good, except that LEGO has already produced a special Fawkes element that is simply stunning. 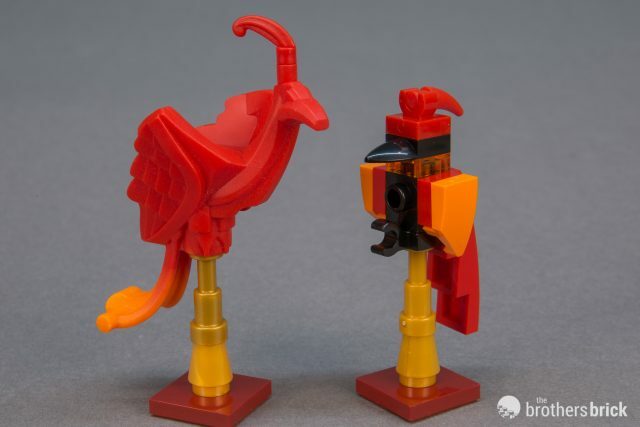 Released in 2002 in the 4730 Chamber of Secrets, the dual-molded orange-and-red Fawkes was one of the best creatures to come out of the early Harry Potter theme. The new Fawkes pales in comparison. 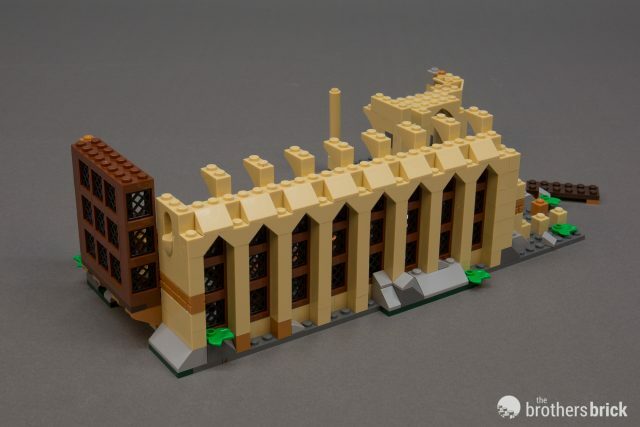 It’s truly a shame that LEGO chose to move to a brick-built version here, but if you can stomach paying $20 to buy the old version, it makes a magnificent upgrade. And then we have to talk about the Basilisk. It’s rare that something in an otherwise great set falls so horribly short of expectations, but the Basilisk is bad. 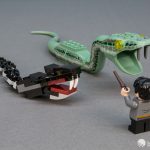 The brick-built Basilisk has six articulated segments, and resembles a monstrous snake only in the vaguest sense, in that it doesn’t have legs and does have fangs. 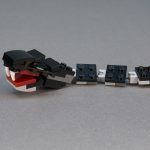 The dark red mouth looks more like a bad lipstick job than an open maw, and the flat segments with boat studs on the bottom make the Basilisk very prone to tipping to the side if you raise its head at all. The version we saw in New York wasn’t great, but the new colors on the final version have made the snake far more cartoonish. 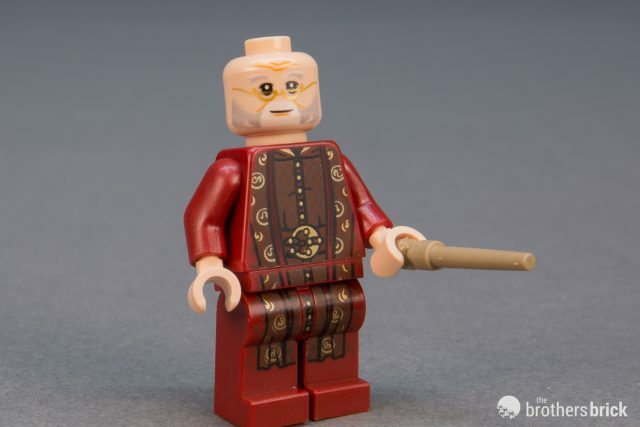 Perhaps the designers ran up against a budget limitation for this design, but it would have been better to leave this creature out than subject what should be one of Harry’s most dangerous opponents to this indignity. 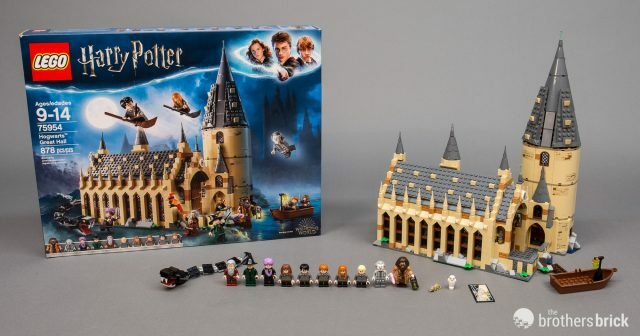 The set doesn’t even include a hiding/storage place for it, so it hangs out awkwardly on the edges of the set. 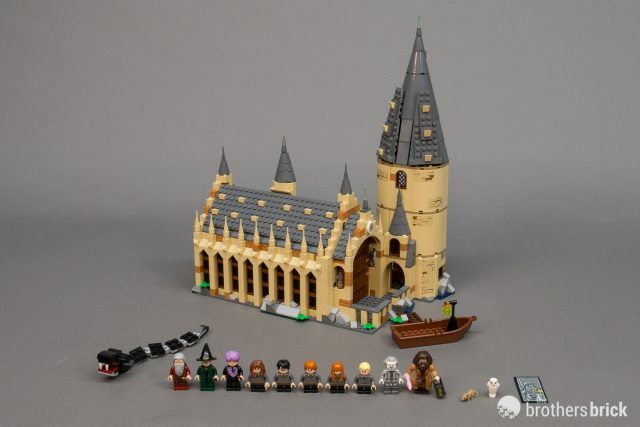 Oh, and that same Chamber of Secrets set from way back in 2002 that included the lovely molded Fawkes? It also included a Basilisk. We’ll let you decide which is more fearsome. 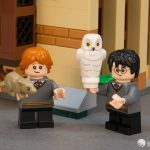 Turning to creatures more cuddly, both Harry and Ron have their familiars. 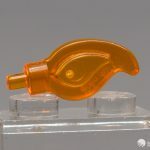 Scabbers is a new rat mold. 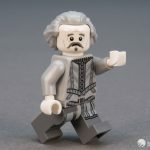 It’s an excellent sculpt, and it will surely find a place in LEGO’s general menagerie. Hedwig is the same design featured in the last few waves of sets, beginning in 2010. 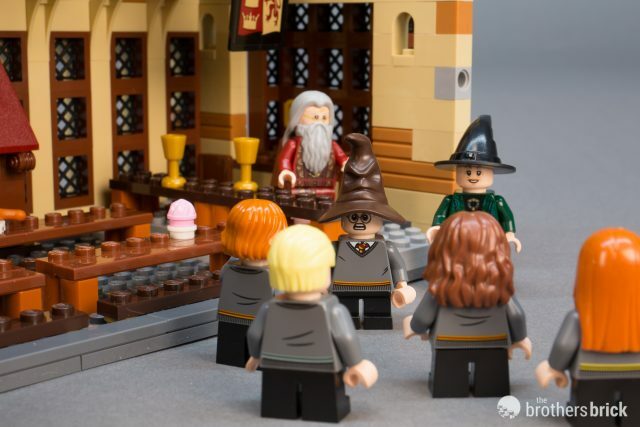 While it’s not precisely a creature, the Sorting Hat is definitely a character. 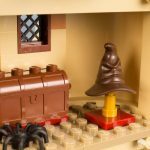 Rather than a standard LEGO wizard’s hat with a printed face as the previous version from 2010, the new Sorting Hat is a sculpted hat that matches its on-screen appearance perfectly. 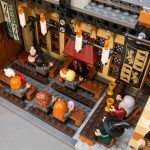 Hogwarts Great Hall isn’t a perfectly accurate recreation of the architecture and layout of Hogwarts, and it doesn’t need to be. 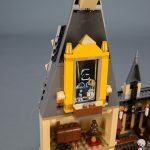 None of us could afford it if it were truly scaled properly, as demonstrated by seeing a true minifigure-scale Hogwarts. 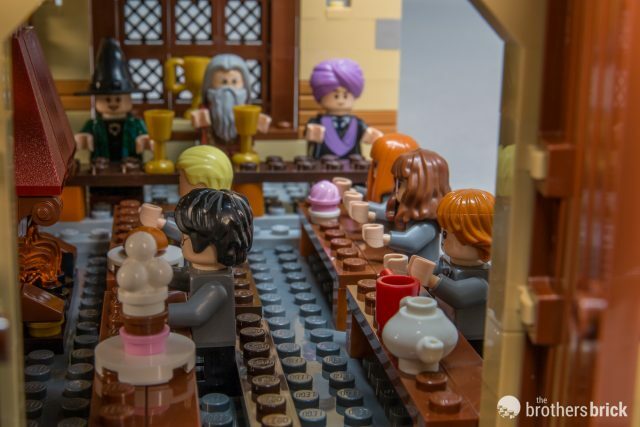 However, the set does an excellent job of giving the impression of Hogwarts, taking us into the rows of students and professors hungrily dining in the Great Hall, and highlighting our favorite moments from the early films with a series of tiny vignettes in the tower. 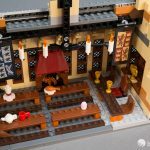 The dining room is wonderfully detailed given the scale, and the exterior of the Great Hall is the most accurate LEGO version yet. 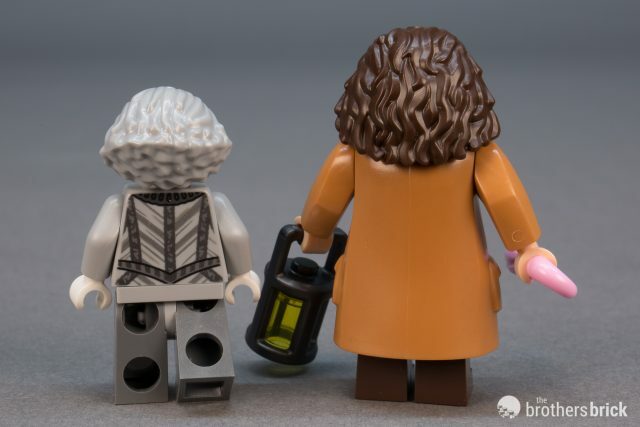 The set’s minifigure selection is excellent. 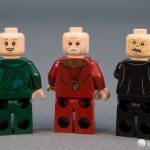 Most adult collectors with an interest in the theme will have a Harry Potter minifigure already, but few will have Quirrell. 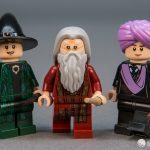 Susan Bones brings Hufflepuff representation for the first time, and the new Hagrid is miles better than the old versions. The students look great in their most junior years. 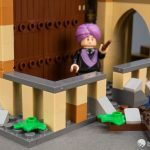 The Basilisk is terrible, but it’s easily overlooked by simply recycling it into its constituent bricks for use in better models. The other creatures range from adequate to adorable. Ultimately, despite a few small missteps, this is an excellent set. There’s lots of play value, and it looks splendid as a display model from any angle. 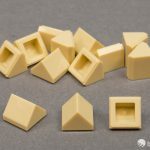 The large collection of minifigures helps the $99 price seem a lot more reasonable, and the plethora of new elements is sure to make any parts monkey giddy. 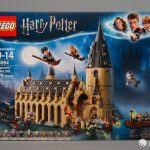 If you love Harry Potter, or just want a huge assortment of new elements in a single set, you’re sure to love 75954 Hogwarts Great Hall. Thanks the very detailed review. 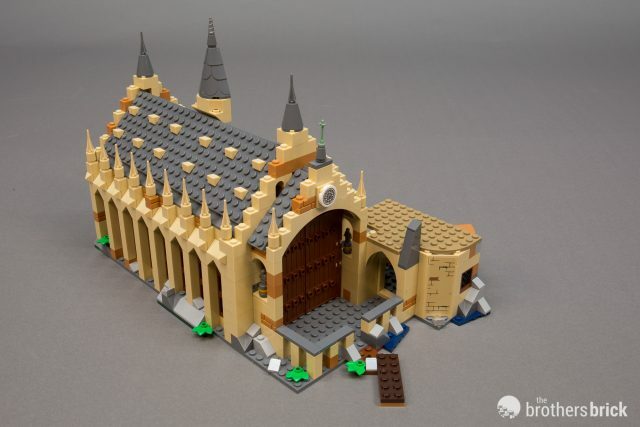 Looks like sadly the tiny half arches that were much talked about in early views of the set (under the railings by the main door) didn’t make the final cut – I hope we will get them in other sets in the future. I can’t believe the old Hagrids were sooo bad! Goes to show how my memory works in a funny (Inaccurate) way. 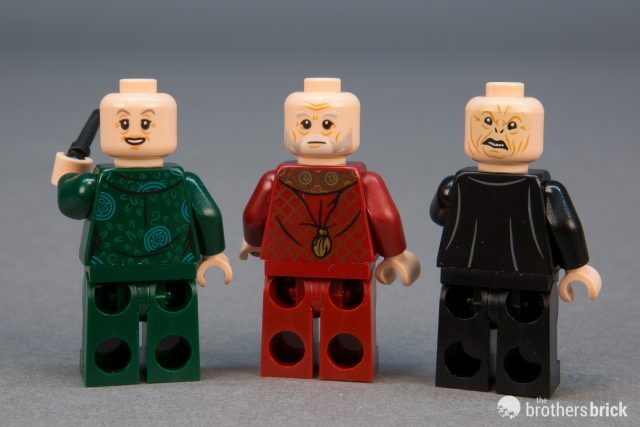 Those ol’ boys look like DUPLO in comparison to the new Hagrid (Which looks fantastic). 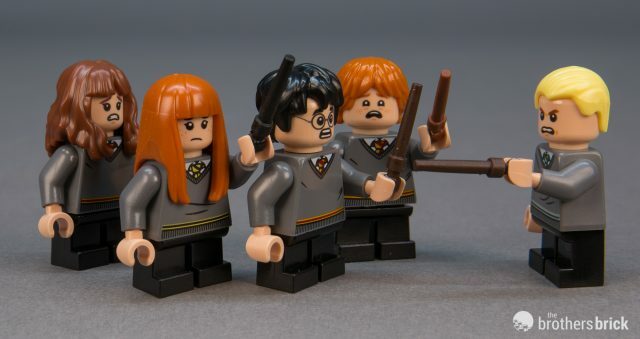 Its funny that the basilisk & fawkes from original set 16 yrs ago are way more detailed & superior. 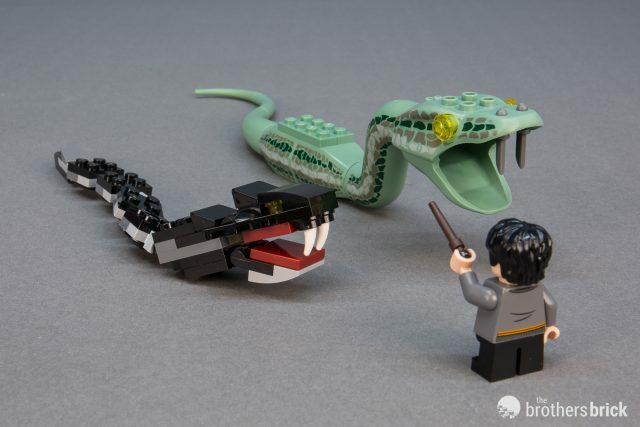 And why is the basilisk black? 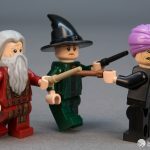 As the 2018 wizarding world sets only feature HP movies 1&2 (plus beasts), will there be future HP sets in the years to come? Waaaaait a minute. 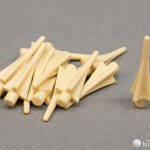 Are the CMFs going to have their wands on sprues too?? Are we getting 2 wands per bag?? ?? 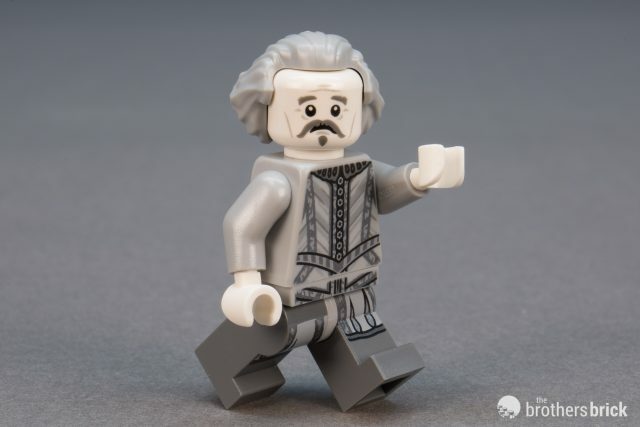 We need a build contest. One that will create a better Basilisk for this set. I refuse to build the one that comes with it. Anybody up to the task?